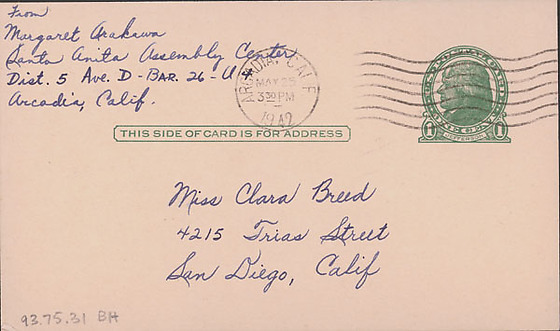 1 postcard from Margaret Arakawa to Clara Breed. 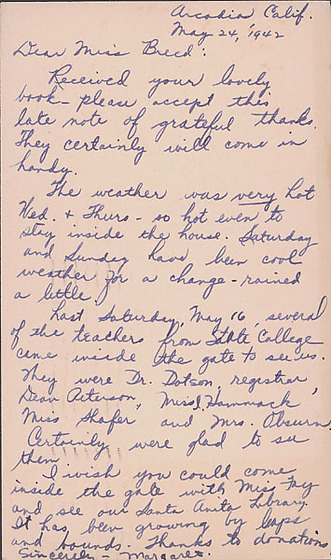 Arcadia, Calif. / May 24, 1942 / Dear Miss Breed, / Received your lovely book--please accept this late note of grateful thanks. They certainly will come in handy. / The weather was very hot Wed. + Thurs--so hot even to stay inside the house. Saturday and Sunday have been cool weather for a change--rained a little. / Last Saturday, May 16, several of the teachers from State College came inside the gate to see us. They were Dr. Dotson, registrar, Dean Peterson, Miss I. Hammock, Miss Shafer and Mrs. Obsurn. Certainly were glad to see them. / I wish you could come inside the gate with Miss Fay and see our Santa Anita Library. It has been growing by leaps and bounds. Thanks to donations. / Sincerely--Margaret.